Staff Sgt. Gary R. Harper, Jr., 29, a Special Forces medical sergeant, assigned to the 2nd Battalion, 5th Special Forces Group (Airborne), died when his reconnaissance mission was attacked by enemy forces near Baghdad, Iraq Oct. 9, 2005. A native of Illinois, Harper entered the Army May 20, 1993 as an artilleryman. Harper’s first assignment was with 1st Battalion, 14th Field Artillery, located at Fort Sill, Okla. The unit worked with the Multiple Launch Rocket System (MLRS). This system provides the Army an all-weather, indirect, area fire weapon system to strike counter fire, air defense, armored formations and other high-payoff targets at all depths of the tactical battlefield. He served there until January 2001. He was then assigned to the 38th Field Artillery, located near Uijongbu, Korea, where he served until January 2003. While serving overseas, Harper was promoted to the rank of sergeant. In January 2003, he began the vigorous, intensive two-year training to become a member of the Army’s most elite unit – the Green Berets. 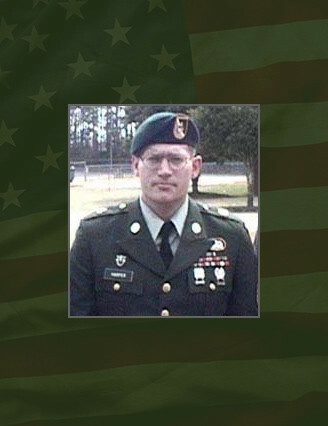 In July 2003, during his Special Forces training, Harper was promoted to the rank of staff sergeant. Harper successfully completed the Special Forces Qualification Course in 2004 and was assigned to 2nd Bn., 5th SFG (A) at Fort Campbell, Ky. in February 2005. Harper deployed in support of Operation Iraqi Freedom in June 2005. His military education included the Survival, Evasion, Resistance and Escape Course, the Special Forces Assessment and Selection Course, the Special Forces Qualification Course, Basic Training, Advanced Individual Training for Multiple Launch Rocket Systems (MLRS), the Basic Noncommissioned Officer Course, the Basic Airborne Course, the Primary Leadership Development Course, the Motor Pool Operation Management Course and the Combat Life Savers Course. His military awards decorations include the Army Commendation Medal, Army Achievement Medal, Good Conduct Medal, National Defense Service Medal, Korean Defense Service Medal, NCO Professional Development Service Ribbon, Army Service Ribbon, Multinational Force and Observers and Service Medal, the Iraqi Campaign Medal, the Global War on Terrorism Service Medal, the Global War on Terrorism Expeditionary Medal, the Combat Infantryman Badge, Parachute Badge, the Driver and Mechanic Badges and the Special Forces Tab. He was posthumously awarded the Bronze Star Medal, Purple Heart and the Meritorious Service Medal. Harper is survived by his mother and father, Linda Mae and Joe C. Morrison of Virden, Ill.; his wife, Danielle, sons, Tristen and Gabrian and daughter, Madison of Clarksville, Tenn.